Mandarin is the only official language of the Republic of China with more native speakers; similarly Mandarin essential oil is an exceptional natural remedy with numerous documented health benefits in the world of Complementary and Alternative medicine including Ayurveda and the Traditional Chinese Medicine. Known as skin-friendly oil, its essential oil is cold pressed from the rind of the Mandarin fruits. The book Ayurveda and Aromatherapy states that Mandarin oil can be combined with Orange oil to make ‘happy oil’. It is also said that this oil is known to bring liveliness in the atmosphere. With excellent pacifying properties, Mandarin essential oil is used in Ayurveda for treating insomnia, nervous tension, stress, mental exhaustion, digestive problems and skin disorders like acne, eruptions and stretch marks. Mandarin is indigenous to China and is now cultivated all around the world including America and Europe since 1805. Italy has been ranked as the top producer of Mandarin essential oil in the recent years. This fruit gained its name from the verity that it was given as a conventional gift to the Mandarins of China. As a rich source of vitamin C, Mandarin oranges have been in use since the primordial times for meeting the nutritional requirements of children as well as elderly people. Mandarin is considered as a safe medicine for treating indigestion, strengthening the liver and the digestive system in aged people in France. The Traditional Chinese Medicine makes use of the dried rind of these fruits for regulating the ‘Qi’ or ‘Chi’ meaning life force, life energy or energy flow and is defined as the basic principle that is a part of every living thing on earth. It was also used in treating improper digestion, excess deposits of phlegm and abdominal distension. Mandarin oranges are also regarded as a Christmas tradition in the United States and Canada where they are individually wrapped in supple green paper and given in Christmas stockings. These oranges were initially a New Year gift for the Japanese immigrants and the advent of Japanese Mandarin oranges were considered as a special signal for the start of the holiday season. Mandarin oranges are also celebrated as a traditional representation of good fortune and abundance during the Chinese New Year celebrations. 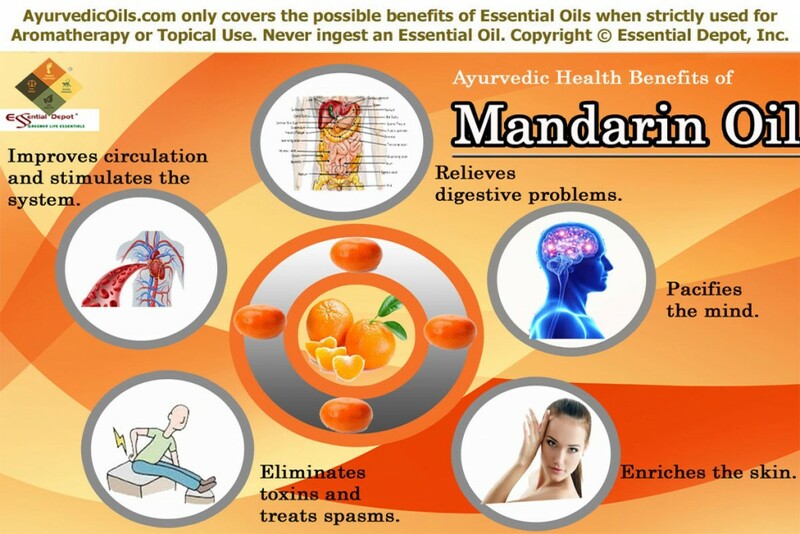 Therapeutic properties and chemical constituents of Mandarin essential oil: Mandarin essential oil has antispasmodic, tonic, antiseptic, cicatrisant, digestive, diuretic, sedative, circulatory, cholagogue, depurative, hepatic, stomachic, nervous relaxant and cytophylactic properties. The major chemical components of Mandarin oil are limonene, citronellal, citral, linalool, myrcene, neral, terpineol, geranial, camphene, a-thujone, g-terpinolene, a-pinene, b-pinene, geraniol, and sabinene. Ayurveda is the mother of all healing systems on earth and is said to be the strongest root for the growth of other Complementary and alternative medical practices like Unani, Siddha, Homeopathy, Traditional Chinese Medicine, Acupuncture, Naturopathy, Chiropractic and Aromatherapy. Ayurvedic philosophy trusts that every human being is a part of nature and one’s wellness depends upon his/her harmony with nature. Illness according to this science of life is an opportunity to discover what’s wrong in a person’s system. Ayurvedic healing does not stop with treating the illness as such instead it traces out the underlying root cause of the disease. This aids in treating the sickness as well as preventing it in future. All the natural remedies in the world fall under the roof of Ayurvedic healing as it strongly state that nature is the best medicine. Herbs, essential oils, rays of the rising sun, yoga, meditation, physical exercises and spiritualism are all the most important natural remedies used in Ayurveda. The best thing about Ayurveda is that it considers every individual as a unique part of nature where every person is made up of an individual constitution that is comprised of three vital bio-energies known as doshas. They are vata, pitta and kapha. These energies govern the functions of the human body physically, emotionally and spiritually. Balance between these doshas indicates healthiness and dosha imbalances cause sickness. Ayurvedic remedies are focused on harmonizing dosha imbalances. Mandarin essential oil is known to aggravate vata energy and pacify kapha and pitta dosha. Mandarin essential oil is a popular citrus oil with excellent benefits to the digestive system. The rich, tangy and citrus aroma promotes digestion and stimulates the flow of bile and other digestive juices. The stomachic and digestive properties of Mandarin essential oil aids in fighting against stomach infections, protects the stomach and intestines from ulcers by maintaining the optimum level of acids and enhance the appetite. You can add 1 drop of Mandarin oil to your hanky or add 2 drops of this oil to your diffuser to improve your appetite and support the process of metabolism. Adding 2 to 3 drops of Mandarin oil to warm bathing water can help in relieving gas, flatulence, nausea and indigestion. Gently massaging your abdomen with 2 drops of this oil blended with 10 drops of wheatgerm oil can assist in treating ulcers, gastritis, esophageal spasms, intestinal infections, colitis, dyspepsia, bloating, flatulence, hiccups and indigestion. Mandarin oil is known as ‘happy oil’ for its uniqueness in bringing joy and solace in the environment. The well-known book ‘Ayurveda and Aromatherapy’ quotes Mandarin oil as “calming and soothing for stress.” The soothing, calming, nervine, sedative and hypnotic actions of this oil appease the mind and boost your self-confidence. Mandarin essential oil is a natural mood-lifter that assists in reducing tension on the nervous system, promote peaceful sleep, nourish the nerves, lessen distress and encourage absolute tranquility and calmness. 2 drops of Mandarin oil added to warm bathing water before bed can alleviate your tensed muscles, mental disturbances, epilepsy, convulsions and nervous afflictions. This medicated bath can help you to fall asleep soon by evoking a sense of encouragement and stillness. You can also add 3 drops of Mandarin oil to your diffuser, burner or vaporizer for treating anxiety, restlessness, fear, fatigue, irritability, stress, tantrums and other negative emotions. This formula works even with children who are over-excited and stubborn especially during the nighttime. Mandarin essential oil has enormous benefits to the skin with its antiseptic, antibacterial, antiviral, cytophylactic, tonic and depurative properties. Excess toxins and deposits of salts and uric acid in the body deteriorate skin health and lessen its natural glow. This is the major reason behind pimples, blackheads, boils and other skin eruptions. Being a depurative, Mandarin essential oil aids in eliminating the unwanted toxins from the body and purifies the skin. This oil is effective in clearing acne, healing wounds, scars, marks, abscesses, boils and lifeless skin. Mandarin oil supports the growth of new skin cells by which it helps in healing scars and wounds. This formula works like a magic especially on stretch marks and Mandarin essential oil is considered safe even on pregnant women. Adding 2 drops of Mandarin oil in steam therapy assists in removing skin impurities, blemishes, black heads, marks and pimples. It augments the natural beauty and glow of the skin. Massaging with 2 to 3 drops of Mandarin oil with 15 drops of jojoba oil aids in improving blood circulation, enhancing the suppleness of the skin and diminishing scars and marks. You can also add 3 drops of Mandarin oil to your regular skin care cream or lotion and apply it on the affected area. Toxic deposits in the body are the predominant factor disturbing the regular functions of the body like respiration, digestion and excretion. This is known as ‘ama’ in Ayurveda. Eliminating ‘ama’ or the harmful toxins from the body is one among the major treatment methodologies in Ayurvedic Panchakarma or the art of purification of the mind and body. Mandarin essential oil is an exuberant oil for eliminating hazardous toxins, uric acid and salts stagnated in the body in the form of sweat and urine. The high-spirited aroma of this oil is known to drain out negative emotions and purify the mind. Add 3 drops of Mandarin oil to warm bath or massage your body with 5 drops of this oil with 2 ml of coconut oil to get rid of the unwanted substances from the mind and body. This massage also helps in treating spasms in the respiratory system, intestine, muscles and the nervous system. When massaged onto the skin, 5 drops of Mandarin essential oil with 2 ml of sesame oil improves blood circulation and helps in relieving from varicose veins, blood clots, rheumatic pain and arthritis. Mandarin oil acts as a tonic to the system and checks the regular functioning of all the vital parts of the body including the nervous system, digestive system, respiratory system, circulatory system, cardio-vascular system and the excretory system. This oil is also said to make the body resistant against contagious diseases by improving immunity. You can add 2 drops of oil to vaporizer, burner or diffuser during any time of the day or night to get yourselves rejuvenated and recharged instantly. All citrus oils have photo-toxicity effect and do not go out in sun as soon as applying Mandarin oil as it may harm your skin. Never use essential oils internally as these oils are highly concentrated liquids and should always be used topically in a diluted form. Consult your Ayurvedic Practitioner before using essential oils for your unique individual constitution and state of health. This article is only for the purpose of information and is not meant to make a diagnosis or replace prescribed medicines or professional advice. 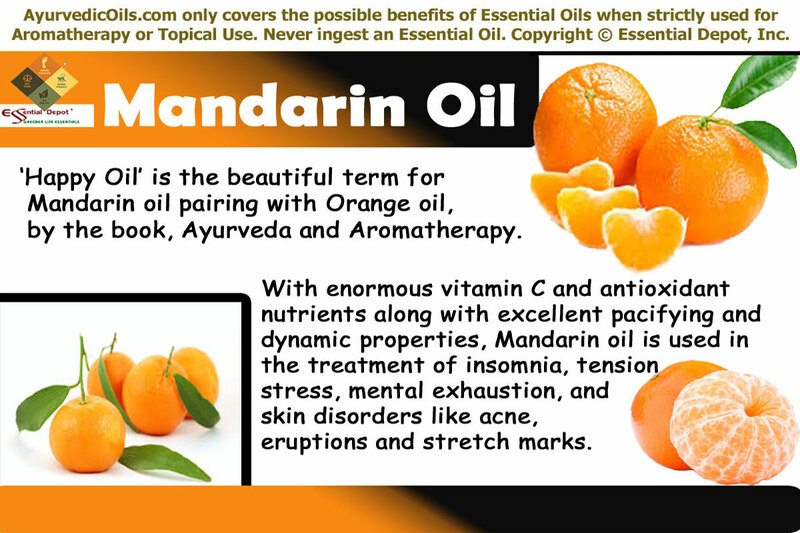 This entry was posted in Essential Oils - Learn About and Purchase and tagged Ayurvedic health benefits of Mandarin essential oil, Ayurvedic oils for acne, Ayurvedic oils for cleansing the system, Ayurvedic oils for insomnia, Ayurvedic oils for rheumatic pain, Ayurvedic oils for scars, Ayurvedic oils for skin care, Ayurvedic oils for stretch marks, Ayurvedic remedies for digestive problems, Ayurvedic remedies for spasms, Ayurvedic remedies for stress, Chemical constituents of Mandarin oil, Citrus reticulata, Health benefits of Mandarin essential oil, Mandarin oil in Ayurveda, Therapeutic properties of Mandarin oil by AyurvedicOils. Bookmark the permalink.